I count ~25 hours until the start of the livestream that will end the jam. I may be crazy but last night I didn't like where my project was going and I would probably not have enough time to finish it. So I am starting fresh. Well, I called out of work to finish my game and ran into loads of issues. I guess it is fate, so I won't be able to submit my game as its unfinished. On a related note however, anyone else not able to use the mouse button inputs in Engine Version 4.13.1? I tried it in 4.10 and it works so it might be a bug?? With this 100MB limit, can we turn off include prerequisites? Last edited by MonsOlympus; 10-13-2016, 08:11 AM. Yes, we have those installed already. Anyone wants me to play their game and make a short video about it? One question regarding the "Best Game Under 100mb"-category: If I upload my game in an archive, will the size be judged by the size of the unpacked files? Jams are always fun when you can participate, even when you can't finish the thing on time. Its been busy months for me lately, and I hope this lets up once our projects are finished, but I couldn't even find the time to join any of the more recent jams. "Settle", an Oregon Trail like multiple choice survival...whatever thingy where you pack your things, prepare for a journey and then go through some decisions along the way, hoping to survive the trip (potentially using the State Machine techniques Richard and Ian showed on the last few training streams). "Tea" (a play on "the") where you're on a ship and have to drop crates into the water (think Boston tea party). "Score", a simple click-the-button-that-lights-up clicker with 2 or 3 buttons. Just hit the button that lights up to bump your score, or something like that. Whats the point of this? All 3 games should be fairly small (fitting into the 100MB rule, if you count them individually), should finish in about 30 seconds to a minute (so you don't have to put up with the silly idea for too long at a time), and they each keep score of what you did during that time (to stay in line with the theme). At the end, provided you "win" (whatever that means in the context of each game), they tell you a code that can be entered in the next game in sequence to give you an advantage - a simple code-based New Game+ (think Zelda Oracle of Ages/Oracle of Seasons pair that gave you codes for the other game after finishing it). This also wraps around, so "Score" gives you a code for "Settle" to bump your scores up even further. The codes alter the game by giving you more starting resources for "Settle", NPC companions that help dropping crates for "Tea" and a simple score multiplier/bonus for "Score". This makes it pretty much an endless game that would at some point peak (or maybe even break), but in the end you're still trying to beat a high score (thus settling the score, by scoring). Nevertheless, it was my first game jam, and it was a great experience participating in it! I gained a lot of practical knowledge this week, and plan to achieve more in other jams from now on. Awesome (we want to sleep so much) Mega Jam guys! Thank you for this. Video from our godzilla-VR-simulator is here, hope you'll enjoy it! Find Professor VR: You're a giant robot, you were created in a hidden science lab (disguised as a normal building) and you're not happy about it. 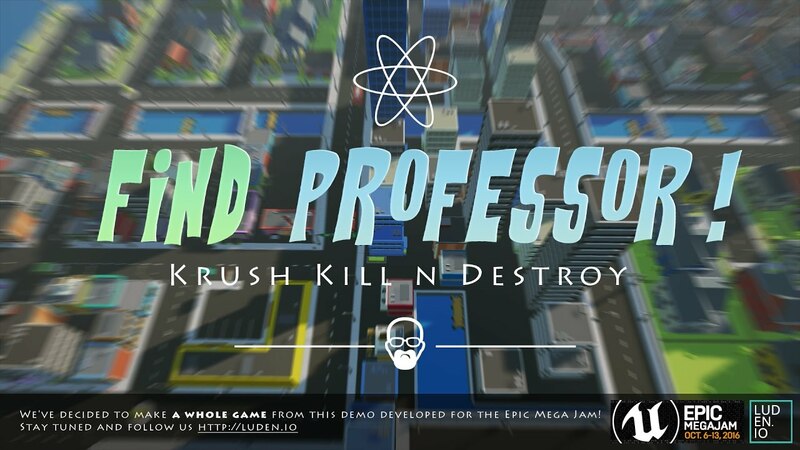 It's time to find your creators "those evil professors" and settle the score!